Just back from a successful regatta campaign. The Beach House boys did very well. More about that up next. 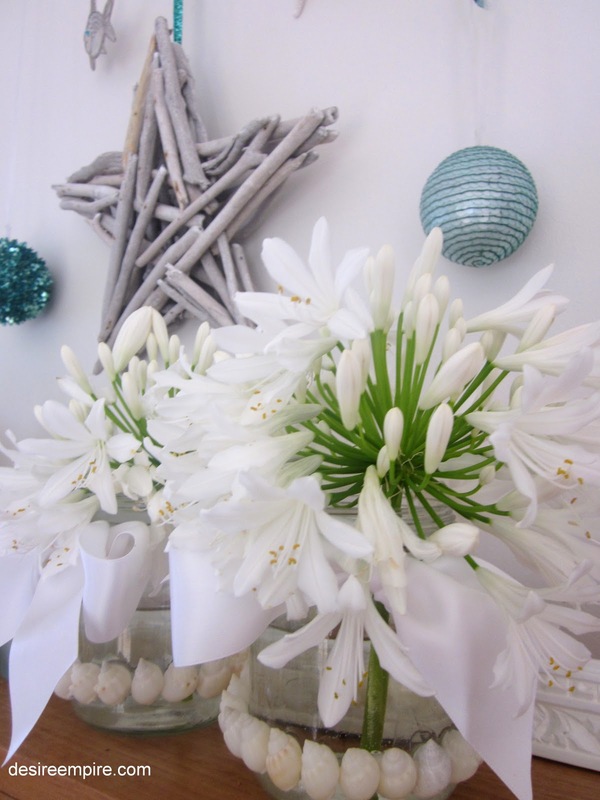 In the mean time I hope you like the floral decorations I put together for my Coastal Christmas table. 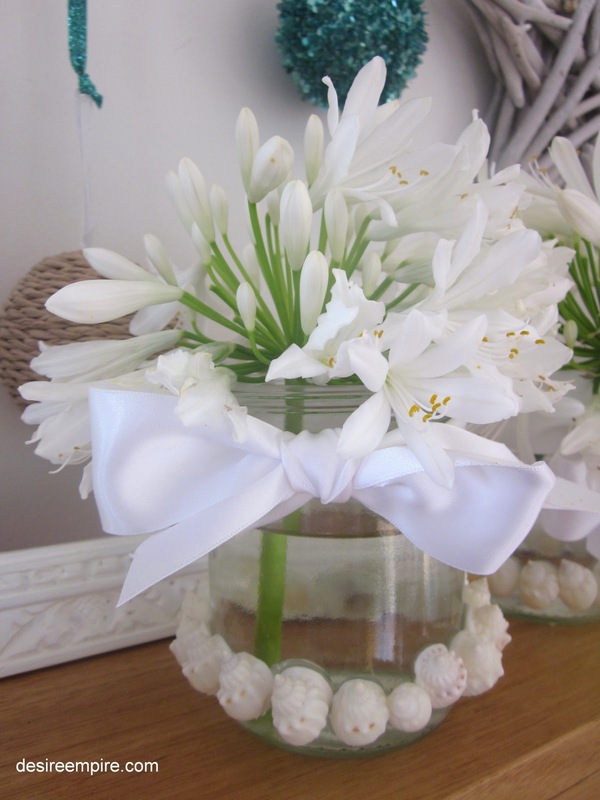 The vases were easy to make and the white agapanthus, Greek flower of love, was a great option, as they look like a little white posy, even though they are just one bloom. A white hyderanga would do equally well. The ribbon was some I had in a draw left over from the baby bassinet. I'll show you the full tablescape this week. It's white and beachy and sure did impress the family on Christmas day, although Mr Beach House wanted to strip it, as we sat down to eat....so practical, what does he know?!!!!! So we have literally driven back into Sydney in the last hour. Mr Beach House and I don't like each other very much at the moment. We only fight in the car on vacation, you know with directions and stuff like that. We almost ran out of petrol too and apparently that's my fault. Had to deviate off the freeway in unknown territory, which was an adventure. The Beach House Brat saved the day by guiding us to the closest petrol station with the GPS on the phone, just in the nick of time. Thank God for kiddo tech heads. Lots of other accusations from Mr BH. Too ridiculous to repeat here. Now he's trying to be nice to me, but I'd rather talk to you!!!! Promise I wont let the sun go down on this one. So, I'm off to make peace. Glad to be back. Can't wait to see what you guys have been up to. Don't forget to enter my seaside style interiors book giveaway and thanks to those who already have. There's only 60 odd entries, so you have a great chance of winning. Your mantel is fabulous! 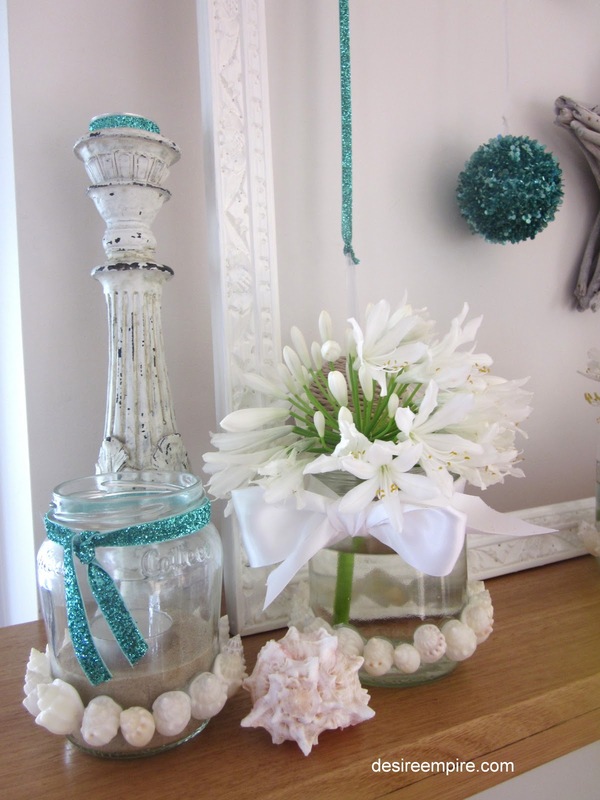 Love the flowered ribbon the pretty jars and the weathered wood star is to die for! Your car trips sound very much like ours did when the children were young. Hubby made them look out the window to keep from fighting! Gas was never an issue, just directions. Thank goodness for the GPS! 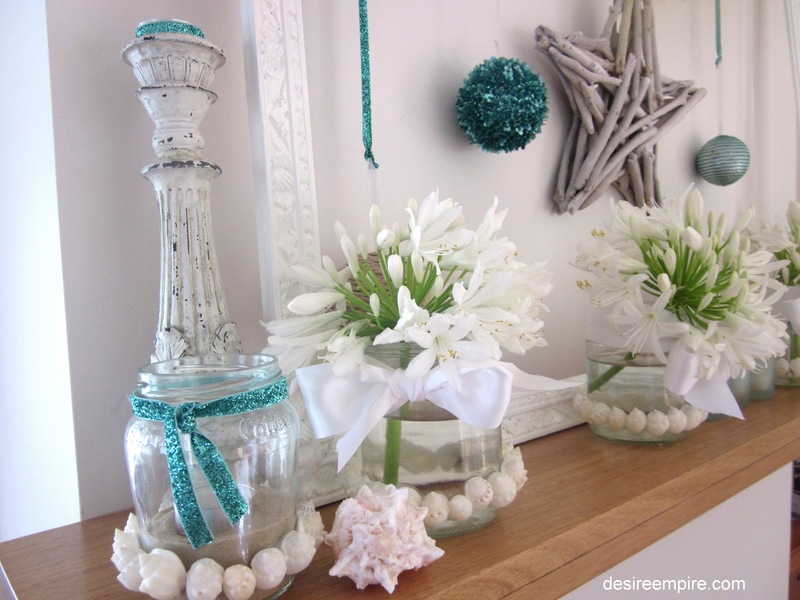 How cozy this beachy Christmas decor is! Love it! Thank you for sharing at my party! 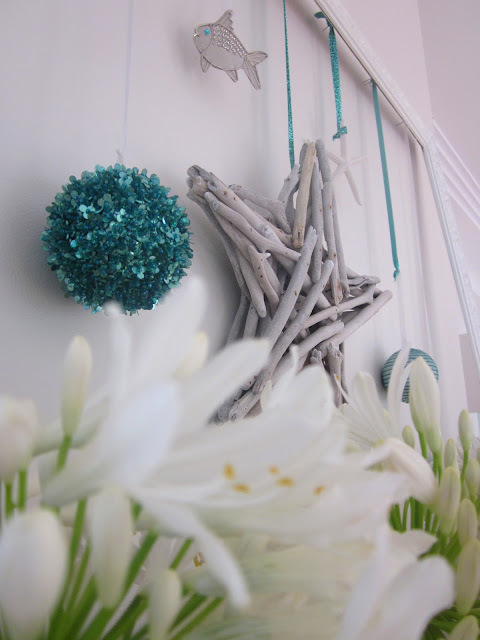 I love the whole look, but I really like the drift wood star! Very unique and cute. I appreciate you linking up - it's beautiful. But TGIF is really a kid-oriented linky. If you ever have any kid projects please link those up! That's really pretty! I love the white, blue, and green together. I'm chuckling over your car trip. You know, I sometimes think husbands and wives should never travel together in a car. Somehow those excursions are often the opportunity for tension. On the other hand, your mantel exudes calmness. Happy New Year my dear!! Your mantel is gorgeous!! I love all your decor. SO sorry about the trip home, hopefully things are back to normal, I don't like long trips in the car either. This is gorgeous! I love the beach theme & the colors are fantastic. So beautiful! I love that we here in the States get to see your Summer decor while its cold and yucky here. Those flowers are gorgeous and I love the driftwood star. Would love you to link up on my Winter Mantle Party on Wednesday. This is gorgeous! Love it! I am a new follower! Found you on Sumo's Sweet Stuff, hope you have a great week! Now this one is sooo pretty. love it. Beautiful. So calming - I love the turquoise accent. My link party - The Inspiration Board is open and I would be so happy if you linked this up. I know my readers would love it.